I know, some of you are bored with my shayris, am I right? ---its natural, taking same foods every day can make anyone bore. 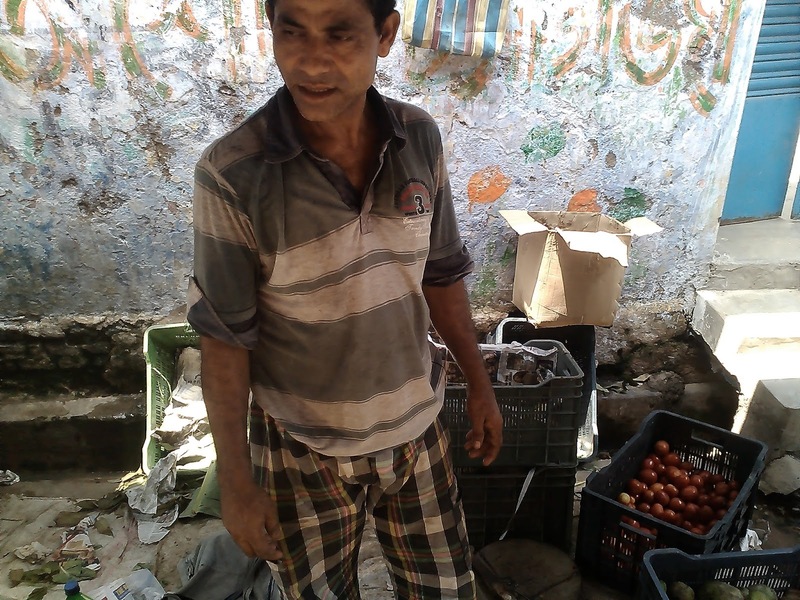 Today I will write about a vegetable seller, they play a very important part in our lives, am I right? What I disliked most is to going for vegetable marketing after taking the morning tea with two bags in my hands(may be one bag in one hand, numbers of bags is not important here), I don’t know why but i don’t like this one, may be one of the reasons is I don’t have any idea about the vegetables with their names, but I had to do it, my father always likes to go for veg marketing and he is very expert in it, but one year ago one day my Mom asked me to bring some vegetables as that day my father was not feeling well, I don’t like this work but it’s also true that we can’t ignore our responsibilities. ---what are you doing? Weight it in your weighting machine? ---- So you wannna check? ---He does not need any weighting machine. It was very tough to believe, but then a boy came with a big bag to take 20 kg of potato, the boy handed over the bag to the seller, he filled the bag with potato as much as he approximated and gave the bag to that boy, taking the bag the boy went out, even he did not ask for weighting. I really became surprised seeing that person, then approximately after one month I went for veg marketing again, not because my father was unwell, actually It is really a very interesting job to buy fresh vegetables in cheap rates(later I became addicted to it) with not much bargaining, so that day that man was selling Pumpkins and ladies fingers, when I reached there, a customer (belongs to poor family) asked for ladies finger of 8 rupees ( those who live by day to day earnings, don’t buy things in weight, rather they buy according to their needs of that day,there left only rs 8 to that poor man after buying other vegs. ), when he asked for 8 rupees of pumpkins, I already calculated that 550gms of ladies finger will be available in 8 rupees, after taking some ladies finger when that seller was about to hand it over to the customer I requested him to weight those, and he made me spellbound, it was exactly 550gm. This is what happens when you do your job with love, concentration and dedication, there are lots of sellers there but no one can do this act---this is what I felt and realized after watching him. I shared this man’s capability with my family and again got scolded for my absent minded nature, because my mom informed me that my father has already told about this person many times. I was thinking about to share this man’s capability with the world--- it delayed as I decided to share this with his picture and after a long gap I went for veg marketing in last Sunday. Last Sunday I visited that market again and asked that man for a snapshot, he agreed happily and said thank you to me shaking my hand, when I was coming back I heard he was informing an seller about that incident, his voice was very loud and was full with joy. 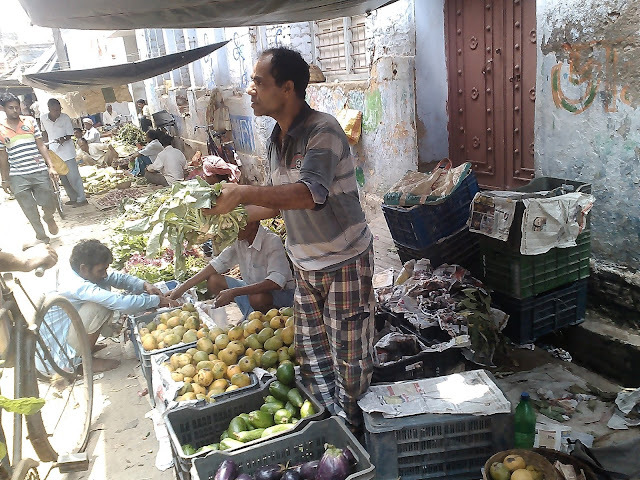 Those who are suffering from high rate of vegetables can avail this market. By the way, can the name of the name of this vegetable seller be recommended for any world record book, like Guinness or Limca? Actually I don’t have much idea about it, any suggestion?